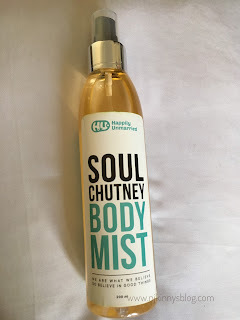 With so many chemicals swirling in the deodorants and perfumes flooded in the market, I have been trying natural, chemical free body mists from various brands and in this quest, I came to know about Happily Unmarried's Body Mist Soul Chutney. 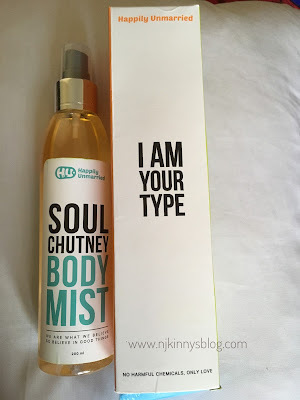 With a non-traditional name and a very trademark packaging with quirky and funny quotes all over the bottle and outer cover, Soul Chutney is a memorable product from Happily Unmarried and definitely "my type"- great smelling and long lasting. It is harmful chemical free body mist with hydrogenated castor oil and a pleasant floral fragrance that doesn't irritate but gently lingers on the skin and leaves you feeling fresh and relaxed for long hours. The spray bottle is plastic which makes it easy to carry around in your hand bag and re-apply as many times as you want. 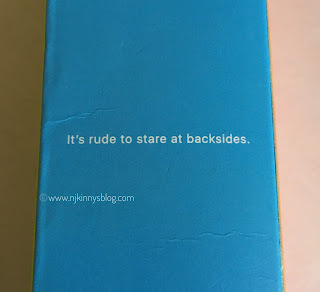 The shelf life of 36 months from the date of manufacture is a plus and the price of 499 INR for 200 ml is pocket friendly as compared to the other body mists in the market. I have been using this product for over two weeks and have no complains thus far. 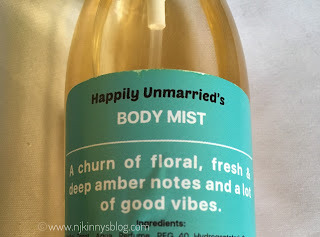 I am absolutely loving this body mist from Happily Unmarried and Njkinny recommends it to everyone. A great gifting option, this is a must buy product if you are looking for pleasing perfume without any harmful chemicals.